I love making my own wrapping paper. At the beginning of the holiday season I usually spend an evening painting some so I’m all stocked up when it comes to wrapping gifts. This year I hand painted a bunch of bold patterns so I’m all set for gift-wrapping season. 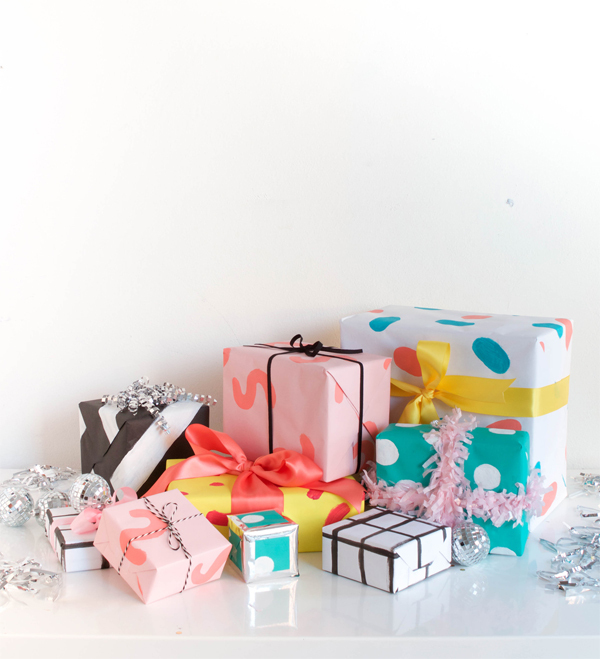 Today we’re partnering with Scotch® Brand to show how you can wrap amazing gifts. 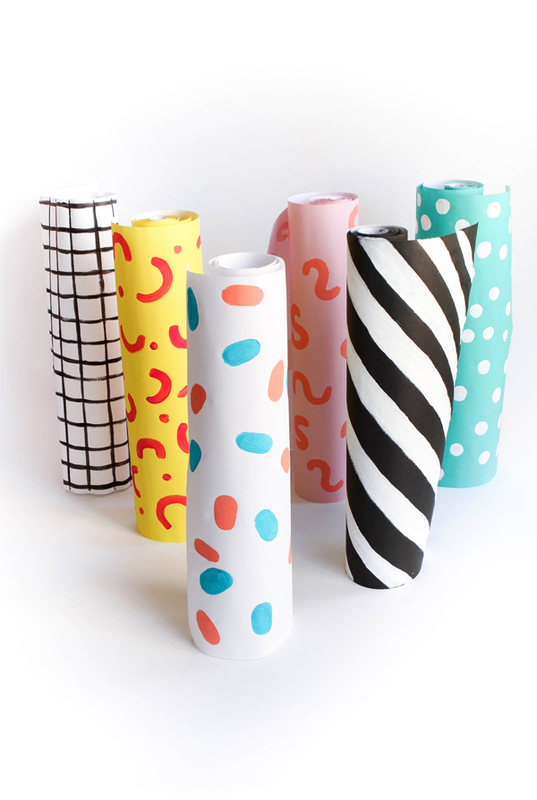 For this hand-painted gift wrap, we first tried experimenting with patterns. It really helped to test designs and colors on the paper to see what looked best together. Once we found the styles we liked best, we painted a ton. It only took about an afternoon to paint six different designs and let them dry. Then they were ready to be wrapped up and topped with ribbon and garlands! 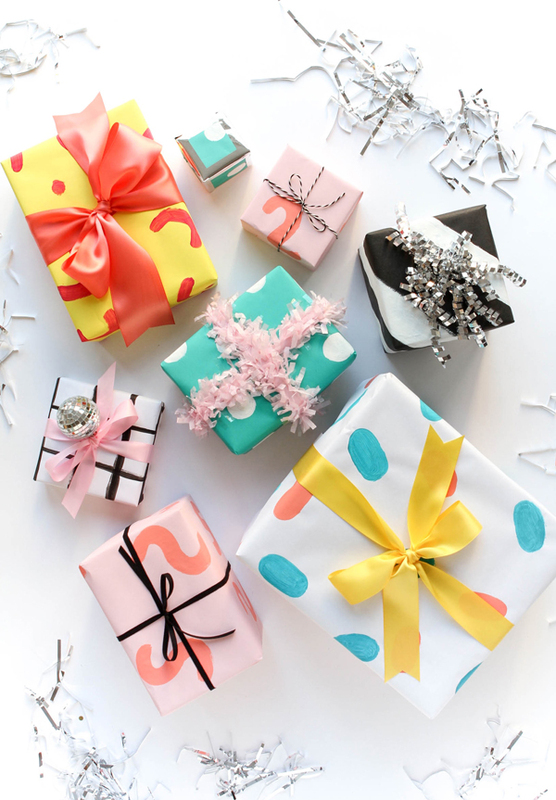 Do you have a special way to wrap gifts? If so, you could enter for an opportunity to win up to $10,000! Enter the Scotch® Gifted Wrapper™ Contest by 12/9/14. Just click here for all the official rules. 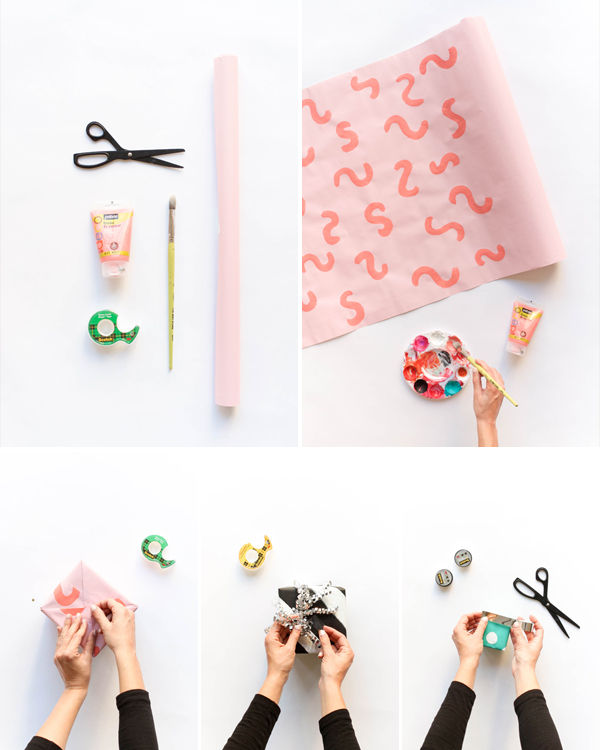 Step 1: Roll out your wrapping paper and paint your pattern. We were inspired by 1980’s designs and colors, so we painted a grid, dots, stripes, squiggles, and half-moons. Let dry over night. Step 2: Wrap your gift with the painted wrapping paper and Scotch® Magic™ Tape. Step 3: Use Scotch® Double Sided Tape to attach gift toppers or ribbon. 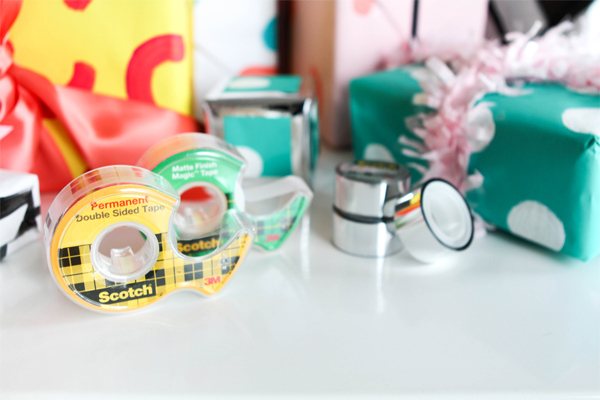 Step 4: Another option is to add Scotch® Expressions Metallic Washi Tape to the sides/corners of your packages. *Contest open to legal residents of the U.S. and D.C. (excluding AZ, CO, NE, MD, NJ, ND, TN and VT), who are 18 (19 in AL and 21 in MS) or older at the time of entry. VOID WHERE PROHIBITED. Enter from November 2, 2015 at 12:00:01 a.m. CT through 11:59:59 p.m. CT on December 9, 2015. All contest communications, entry/judging criteria and details subject to the full Official Rules. Sponsor: 3M Company, St. Paul, MN. I just love your wrapping paper, it’s so colourful and really something different from the ordinary Christmas wrapping paper! This wrapping paper is gorgeous! You did an amazing job! 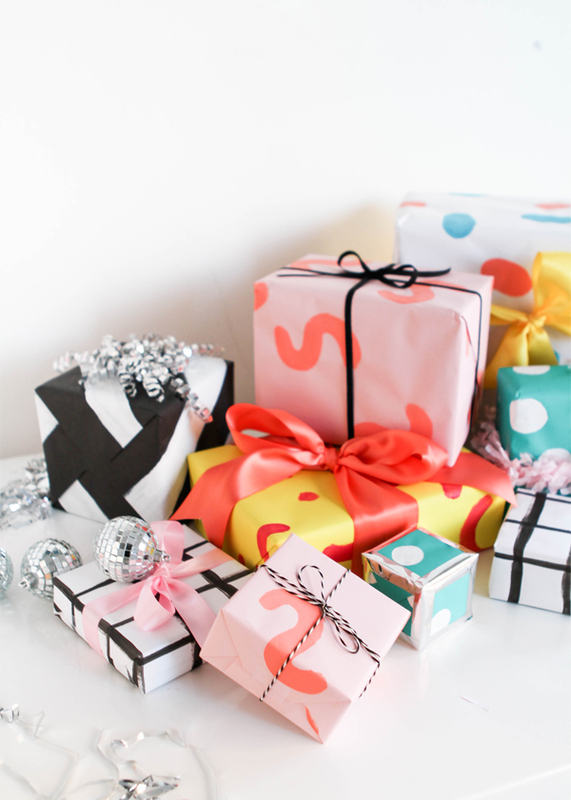 I really love that wrapping paper its so cute and fun I must try wrapping my presents nice this year! These are absolutely gorgeous! 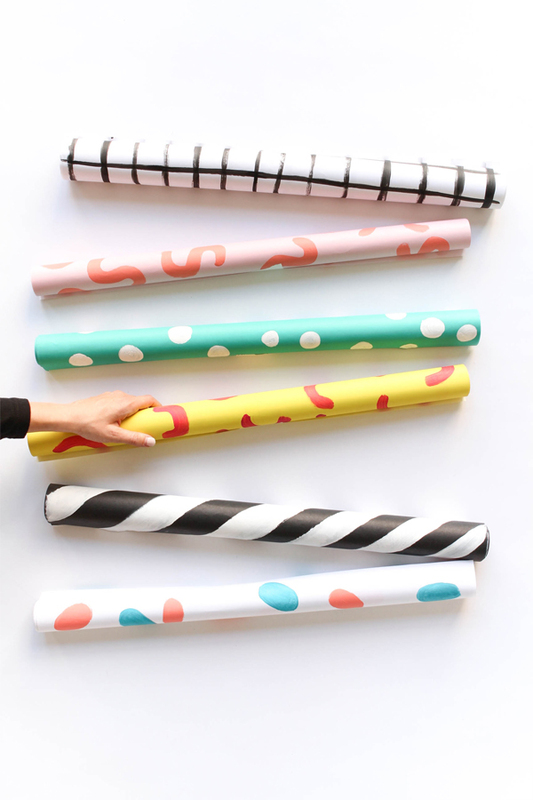 I’d really love to try painting my own wrapping paper!